Hanging in the autumn sky and shining on the wet dewdrops, so bright is the moon that everything in the world is bathed in moonlight. With the approach of the Mid-Autumn festival, the commanding moon, high in the night sky, leaves people to infinitely daydream. Look up at the moon and look down at the wrist where radiance lingers. Since we have never been so close to the time, the fleeting moment along with the wax and wane of the moon presented by the moon phase gives rise to breathtaking and captivating effects. 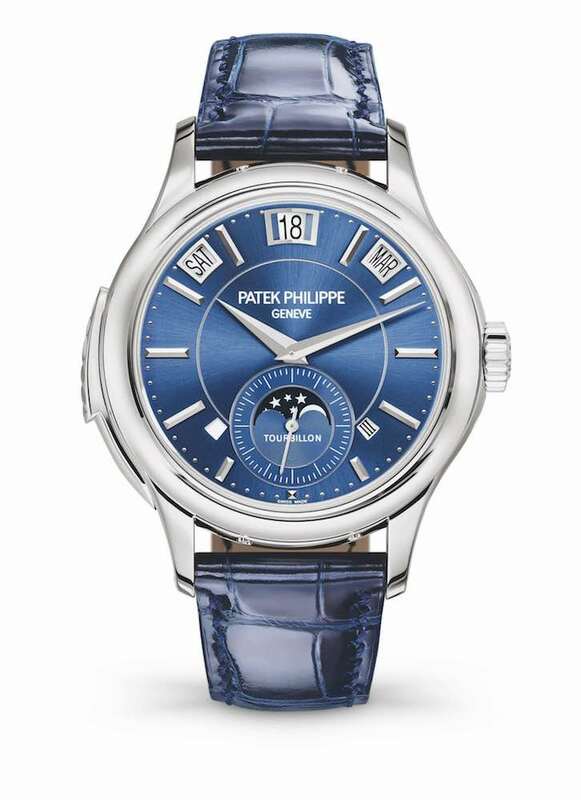 Patek Philippe is pairing the white gold case with a new blue dial. Its sleek, dynamic and contemporary look is perfectly underscored by luminous three-face Dauphine hands, applied white-gold hour markers, slightly concave bezel and the delicately pierced strap lugs. Consisting of 356 parts, the self-winding Caliber 324 S QA LU 24H/206 features Patek Philippe’s Annual Calendar mechanism, patented in 1996. The annual calendar function automatically recognizes months with 30 and 31 days so it only needs to be manually adjusted once each year, at the end of February. The elegant two-tone sunburst dial is recognizable by three apertures along an arc for displaying the day, the date and the month. At 6 o’clock, a secondary dial displays the moon phases and an extra 24-hour indicator. Highly precise, the moon-phase display will deviate from the actual position of the moon by merely one day every 122 years. First introduced in 2016, the Saxonia Moon Phase adopts a new look with a black dial in an 18k white gold or pink gold case. In this extraordinary version, to match the black dial, the date numerals are white on a black background, underscoring the restrained elegance of the overall design. The outsized date and the seconds subdial with the integrated moon-phase display are centered on the vertical axis. Most noticeably of all, the moon-phase display is decorated with 852 stars and calculated to remain accurate for 122.6 years. It is connected to the hour-wheel continuum and, just like the moon itself, constantly in motion. A large central rotor with a centrifugal mass made of platinum 950 winds the Lange L086.5 manufacture caliber while the generously dimensioned mainspring barrel delivers a power reserve of 72 hours. For Baselworld 2018, Blancpain reinterpreted the complication of the Villeret Collection by launching the new Quantième Complet GMT enhanced with Blancpain’s patented under-lug correctors. When referring to Blancpain’s moon phase, the first thing that comes to mind is the rich and interesting face of the moon. Corresponding to the moon phase, factors such as years, collections, functions and gender contribute to the variable countenance of the moon with the emotional state becoming different even if changes are only subtle. A highly recognizable moon stands out from the moon phase window at 6 o’clock. People can’t help but stop and enjoy whether their eye contact is intentional or not. 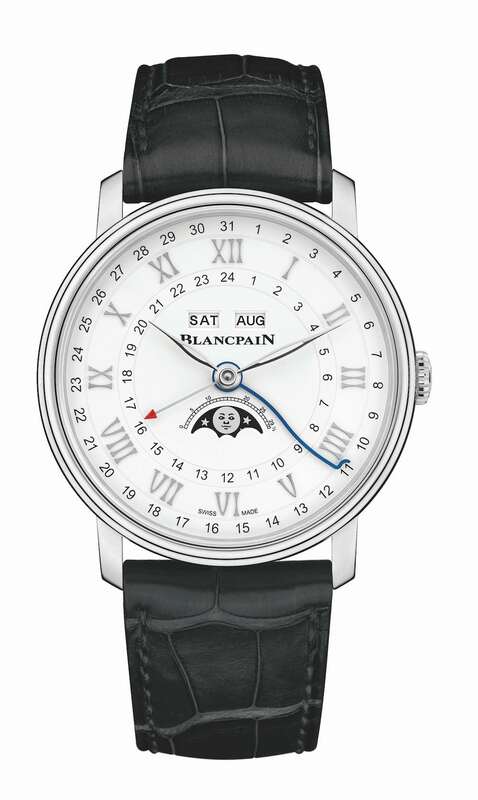 Blancpain’s design displays the day of the week and month in windows and the date with a supplemental blued serpentine-shaped hand reading upon a scale positioned around the chapter ring. IWC Schaffhausen unveiled five limited-edition Portugieser wristwatches at the Salon International de la Haute Horlogerie (SIHH) in Geneva to celebrate its anniversary. The Portugieser Constant-Force Tourbillon Edition “150 Years” is one of the most technically sophisticated watches in the collection. 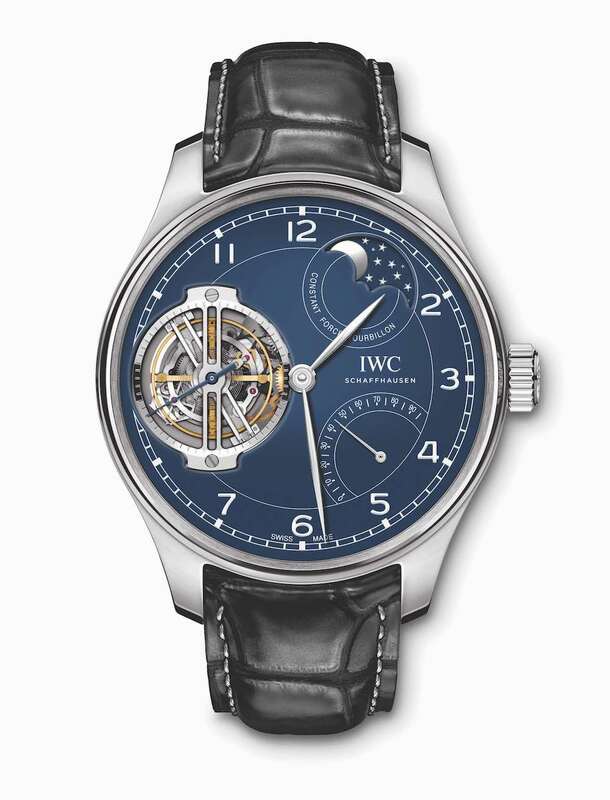 For the first time, the new IWC-manufactured hand-wound 94805 Caliber with a power reserve of 96 hours combines a constant- force tourbillon with a simple moon phase display that only needs to be adjusted by one day every 577.5 years. The patented constant-force mechanism transmits completely even impulses to the escape wheel. In conjunction with the tourbillon, which compensates for the negative influences of gravity on the watch’s oscillating system, this allows for an exceptionally high level of precision. A total of 15 watches will be made for each model: platinum case, white dial with lacquered finish and blued hands; or platinum case, blue dial with lacquered finish and rhodium-plated hands. 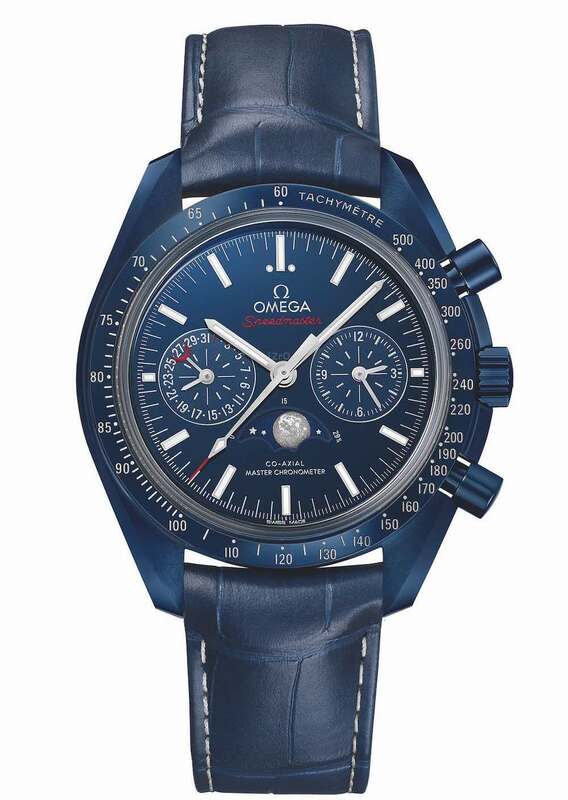 The OMEGA Speedmaster enjoys a close relationship with the moon, having been a part of all six lunar missions. When Neil Armstrong and Buzz Aldrin stepped onto the lunar surface on 21 July 1969, the Speedmaster Professional earned the moniker the Moonwatch by which it has been known ever since. This “Blue Side of the Moon” watch takes its name from the color of the dark blue sky. The 44.25mm watch features a blue ceramic case complemented by a blue ceramic bezel ring with LiquidMetal tachymeter scale. Powering the timepiece is the OMEGA Co-Axial Master Chronometer 9904, which has been officially certified by METAS. 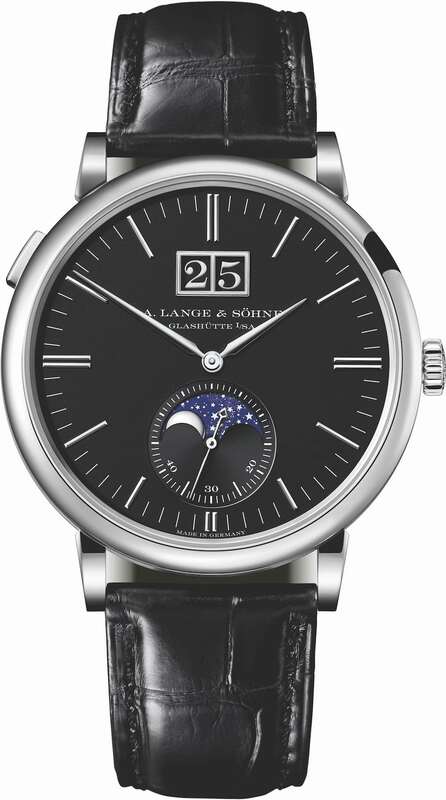 The most striking highlight is the accurate moon phase indication at 6 o’clock, which features a blue ceramic moon phase disc with near and far sides of the moon in LiquidMetal, portraying the details of the surface of the moon vividly.